Anyone who has ever visited the Exhibition Hall of PAX knows that it is usually a fairly claustrophobic experience. As I stated in PAX Prime Part One, the epic lines looped around each booth where attendees patiently waited for their turn to play one of the many big budget titles being showcased during the convention. I am not patient. Instead, I usually choose to seek out the many unknowns and independents that have poured gobs of time, money and love into the games they are exhibiting. And luckily, PAX always lavishes praise and attention on a few of these smaller startups, fulfilling the wishes and dreams of their creators in something they call the PAX10. With the combination of the PAX10 and a couple of PSN/XBLA sized titles, I kept quite busy playing a few that I would recommend for those looking for the smaller, downloadable set in the future. 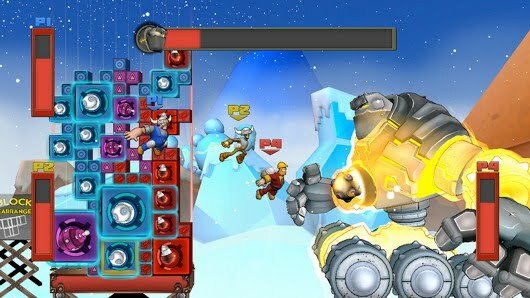 When we were in Boston for PAXEast we got to play a couple of rounds of Slam Bolt Scrappers, a game that I would describe as a kind of Tetris brawler. We played four player combat, with Matt & I battling another couple by first grappling with a tiny colored monster that turns into a block piece, then placing the block piece in a rack to create turrets and guns to attack your opponent on the other side of the screen. The color sequence is vital, because if you can place blocks of all one hue together it increases the size of the artillery used against the other players. The combination of puzzle elements, cute chubby flying monsters and color matching challenges all make for a great party game. Once he discovered that we had played before, the Firehouse rep let us all battle against a robot in co-op mode instead of against each other. It was chaos! Incredibly fun, viking-hatted chaos. I was super glad to hear that they had secured a place on the PSN. Their tentative release date is sometime in Q1 of 2011. 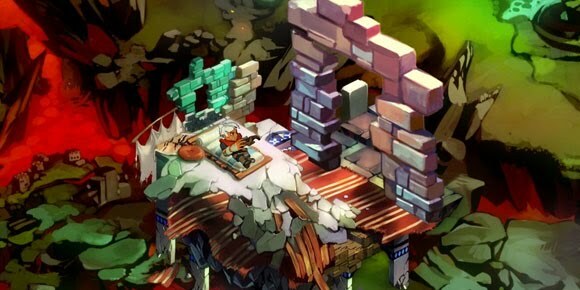 One of the PAX10 I had on my eye on was Bastion, a visually stunning action adventure/RPG-like game by first time developers, Supergiant Games. And my god, Bastion is beautiful. The colors are deep hued and vivid, with swirling clouds and trees in the background and perfectly shaded blocks and creatures in the direct aspect. I was able to play the first section of the beginning and it plays very much like an action adventure game, with weaponry on X/A/B and health potions on Y (assuming it contracts with XBLA, of course). You start off as the hero, waking up on a stone platform floating in a colorful sky. As you awake and walk forward, the world builds itself under your feet. A narrator (that, oddly enough, sounds to me a lot like The Stranger from the Big Lebowski) tells us that our hero is trying to put the world back together. All of the breakable environment items turn into tiny blue seedlike materials that gravitate towards you. I asked the exhibitor what they were and he said they were pieces of the world. The more you collect, the more objects you can create. I adored the lush and captivating look of Bastion. 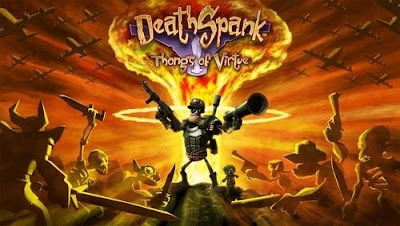 The release date is tentatively schedule for Q2 of 2011, and although I played it using an Xbox controller, there is still no confirmed platform for the game. 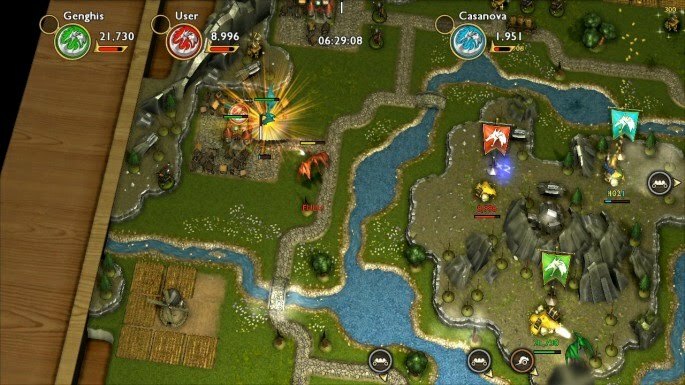 I was also impressed by Hoard, a top down dual analog action game ‘about dragons and their treasure’ created by Vancouver's Big Sandwich Games. We were lucky enough to get to play two rounds of Hoard, one co-op and one versus, with Tyler Sigman, the designer of the game. You play as a dragon flying over a medieval landscape of watchtowers, small townships and fields. And as a dragon, your objective is to pillage and burn as much of the above as possible. There are princesses to kidnap, villagers to scare, wagons to steal gold from and knights to eliminate. As seen from a top down perspective with a frame of wood surrounding the land, Hoard is definitely paying homage to the tabletop gaming genre. And I have to admit, it's pretty fun hijacking pointy-hatted princesses from their carriages in order to turn around and ransom them back to the kingdom for gold. We asked Tyler about the variation of the game and he said there are dozens of maps and a few other game types beyond co-op and multiplayer. He also educated us on the best ways to obtain higher scores by allowing certain villages to become more valuable before just casually burninating the entire map. The game was a lot more intricate and challenging than I originally thought at first glance, and should be a great fit for strategists and party gamers alike. Hoard will be released on PSN this month, and is definitely worth the investment. It's always great to support the independent market. I feel as though this is where we always see the most innovation and the real risks being taken. Without these gems we are doomed to see only less risky sequels flooding the market-I believe the game market needs them to survive. I suggest you give a few of the above titles a try, as you will not be disappointed. And I would like to thank Penny Arcade for the PAX10, where every year unknown or emerging designers can promote their work in the most friendly and welcoming environment. Kudos. Glad you enjoyed taking a look at HOARD. Thanks for the nice writeup!